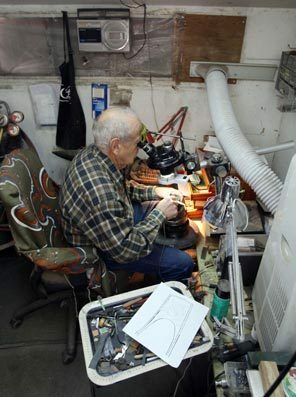 A few weeks ago, I wrote a post about a profile that the San Francisco Chronicle published on expert knife sharpener Eric E. Weiss. Yesterday, I stumbled onto another neat profile of a knife expert; this one, by the Seattle Times, featured expert knife maker Dwight Towell. Towell, 76, lives on a small Idaho ranch, where he has been making knives since 1966, when he made a hunting knife for his son. Today, collectors across the world pay thousands of dollars for his custom knives, which have a waiting list of five to six years. A dagger he recently sold at the Art Knife Invitational in San Diego was purchased for $12,800. He is currently working on an engraved dagger with 14 and 24-karat gold stones from Russia. Towell, who estimates that he has made more than 1,200 knives in his life, retired from his job raising cattle in 2004 to focus full-time on making knives. However, he said he doesn’t plan on stopping making knives anytime soon.